Applications are reviewed during the Board’s monthly meetings. An application must be complete to be placed on the Board’s Agenda. Once an application is approved, applicants will receive notice by email of the approval. Following Board approval, the jurisprudence test is emailed or mailed to the approved applicant to complete and return to the Board. Upon receipt of the successfully completed test, the license is issued and a digital copy of the license is provided via email. New licensees receive their wall certificate via U.S. mail. For questions regarding the licensure process or the status of your application, please contact Ms. Linda Dlugosz at (205) 985-7267 or email linda@dentalboard.org . This form MUST be completed by all applicants for licensure and submitted with the appropriate application below. "The Board will only accept regional dental examinations for initial dental licensure by regional exam that include a periodontal examination section conducted on a live patient and a prosthodontic examination section that includes preparation of abutment teeth on a manikin for a fixed prosthesis wherein the bridge draw is evaluated." Per March 2012 Minutes. 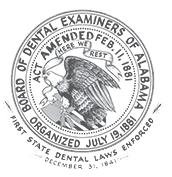 Rule 270-X-4.10 requires that all 501(c)(3) entities register with the Board of Dental Examiners. Please complete the form below and return it and the required supporting documents to the Board. Please note that the form is also used for updating registrant information. Please review Rule 4.10.